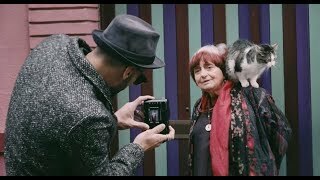 “Faces Places,” co-directed by JR, the well known French photographer (and former graffiti artist), and the Belgian-born, French New Wave filmmaker Agnès Varda, poignantly presents the story of people who otherwise would not be noticed, people who stand beside or behind or who support those who are more likely to capture our attention. In the movie, JR and Varda travel around the French countryside in JR’s photo-studio-van, meeting people – a waitress, a farmer, factory workers, the wives of dockworkers, a miner’s daughter, and many others — learning about their lives. JR photographs these ordinary and sometimes not so ordinary citizens, and pastes monumental black and white images of them on their houses and in their communities. Agnès Varda (left) and JR (right) in Faces Places directed by Agnès Varda and JR. Photo courtesy of Cohen Media Group. JR and Varda are a remarkably odd couple. JR is in his early thirties; Varda is pushing ninety. At all times in public, JR appears in a fedora and dark glasses, and he exudes French coolness and dash, but with a charming modesty. He is tall and thin, and a scruffy version of handsome. Varda, by contrast, is elderly bohemian. She wears a strange, two-toned, bowled haircut that resembles a tonsure. She is short, roundish, and has trouble seeing. JR made a name for himself by traveling around the world and composing black and white portraits of ordinary people, blowing the portraits up and, often illegally, pasting them on homes, walls, trains, water towers, and other public spaces. “Faces Places” unveils JR’s work process. The addition of Varda’s story is what makes this movie special. The wistful vignettes from Varda’s life, together with a frank exposition of the challenges she faces related to memory, aging and death are poignantly developed in the film through the growing, endearing relationship between Varda and JR.
At one point in the film, a factory worker fascinated by and admiring one of the images being installed, comments to JR, “Art is meant to surprise us!” And indeed, JR and Varda confirm that their intent is to demonstrate the power of imagination, to stimulate others to dream, as well as to celebrate and honor the ordinary people they encounter on their journey. There are many lovely, compelling encounters in the film, together with captivating, beautiful photography and cinematography. In one, JR and Varda travel to the large French commercial port at Le Havre during a dockworkers’ strike. All of the dockworkers, unsurprisingly, are men. So JR and Varda seek out three of their wives – strong women who stand behind and support their husbands. JR and Varda interview the women and, to recognize them, paste huge portraits of them upon a mountain of shipping containers stacked at the port. Varda’s desire to preserve her memories, as she approaches the end of her life, is manifested in various scenes of the film, including a trip to the grave of Henri Cartier-Bresson. The loss of her vision is one of the film’s central themes. She worries that each new image she experiences will be the last she will ever see. There also are a number of episodes which focus upon her aging body. In a wonderful sequence, JR takes pictures of her wrinkled toes, about which she is self-conscious, and pastes large images of them on the sides of tanker railroad cars. In a play upon the theme of vision, Varda teases JR about his dark glasses, and tries to convince him to remove them. Apparently Varda once convinced her friend Jean-Luc Godard to remove his signature dark glasses, and she notes that JR reminds her of the famous filmmaker. At the end of the film, Varda and JR take a side trip to Switzerland to visit with Godard, and after he stands them up, JR finally agrees to take his glasses off, but we see only Varda’s blurry image of him. You may have read Studs Turkel’s oral histories of common Americans or seen the photoblog and book Humans of New York. JR accomplishes much of the same, but takes the genre one step further by plastering the blown-up portraits he creates in public spaces. Ultimately, the film is about relationships, aging, and about things that we see and things that we fail to notice. It is a film about aspects of our lives that we may be blind to, or that we blind ourselves to. Do not miss this one. It is now out in many mainstream theaters — it opens at the Ritz East on Nov. 2 — and it is beautifully executed, moving and inspirational. For more reading and looking, check out JR’s wonderful TED Talk (he won the TED Prize in 2011), which includes, among other things a glimpse of his brilliant Face2Face project, in which he traveled to Israel and, on the wall that separates Israel proper from the West Bank, he pasted large format portraits he took of Israelis and Palestinians who do the same job – such as farmers, taxi drivers, teachers. It was impossible to discern who was the Israeli, and who was the Palestinian. Next  Introducing Socialist Grocery, a new comic by Oli Knowles!